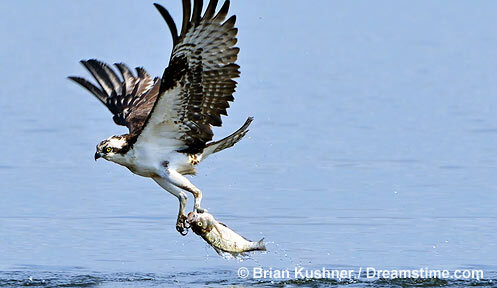 Federal Status: Not listed; Osprey are protected in NH under the US Migratory Bird Treaty Act. Possession and take (which includes harming, harassing, injuring and killing) is illegal. Distribution: Begins to arrive in NH in April and pairs breed statewide. May also be seen during fall migration which peaks in September. Description: 21-23” long with a 59-71” wingspan. Osprey have a white breast and white belly with a dark brown back and wings. Osprey heads are white with a dark eye mask that runs from their black beak to the back of their head and down the nape of their neck. Osprey eyes are yellow and legs and feet are gray. Voice: High pitched whistles that can be given as chirps or long rising and falling wails. Habitat: Ospreys use a variety of habitats as long as they are close to large open water bodies where they can fish and have large, tall trees for nesting. 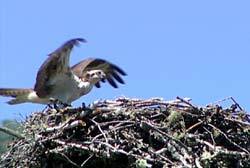 Nesting: Ospreys arrive in NH during April to breed and raise their young. They build large nests out of sticks on dead trees and on man-made structures (i.e. utility poles, platforms, bridges, etc. ), usually within 1-2 miles of rivers, lakes, estuaries and other bodies of water with fish. Females lay 2-4 eggs and do most of the incubating for about 30 days while the male provides food. Chicks hatch over a period of about 5 days and older siblings can dominate younger siblings. Young ospreys are able to fly after about 8 weeks but remain dependent on their parents until the fall. During late summer or early fall, ospreys migrate south for the winter where the young will stay for 2 years before returning north. Diet: Almost entirely fish which they catch by diving feet-first into the water at speeds up to 80 miles per hour.